Brian Baldwin works the counter at Sondra’s Silver Sage Cafe and convenience store. 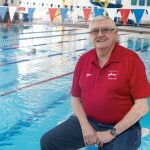 Brian and his wife Jenny Baldwin bought the Vernon business nearly five years ago. Brian and Jenny Baldwin with their children Farrah, Cozette, Eden and Van. 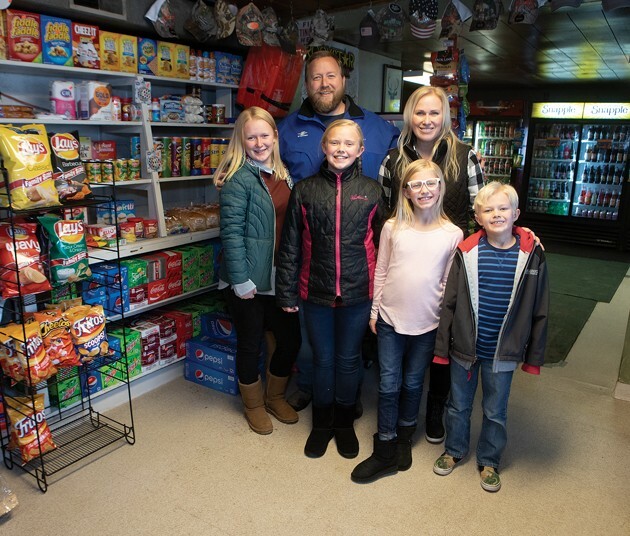 Sondra’s Silver Sage offers food, fuel and a variety of goods to Vernon residents and visitors. The next closest services are more than 30 miles away. 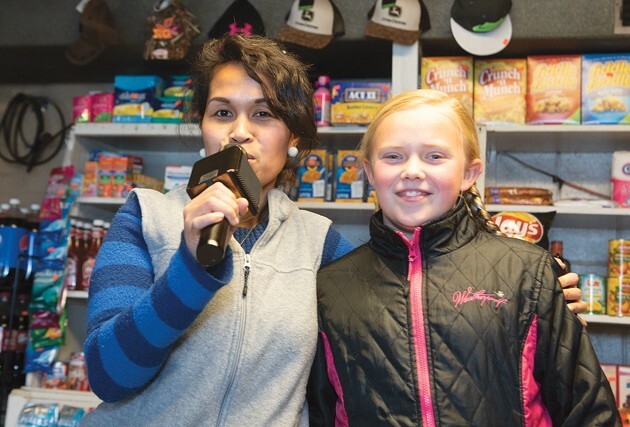 Aillen Calegio and Cozette Baldwin sing karaoke at Sondra’s Silver Sage. 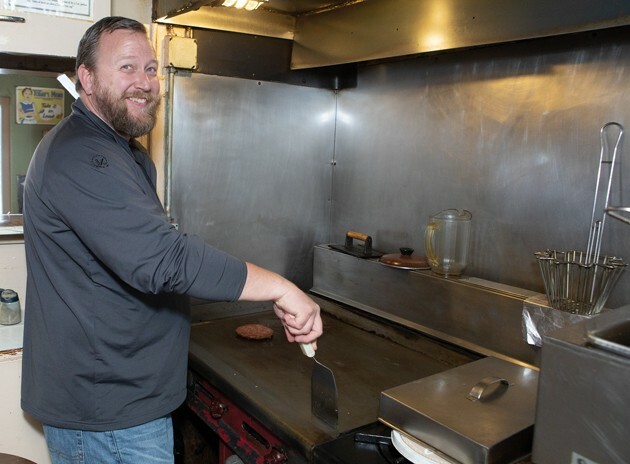 Brian Baldwin works the grill at Sondra’s Silver Sage Cafe and convenience store in Vernon. Jenny Baldwin talks to her daughter, Eden, at the counter. The Baldwins named the business after Jenny’s grandmother, Sondra Rigby, who lived in Vernon. 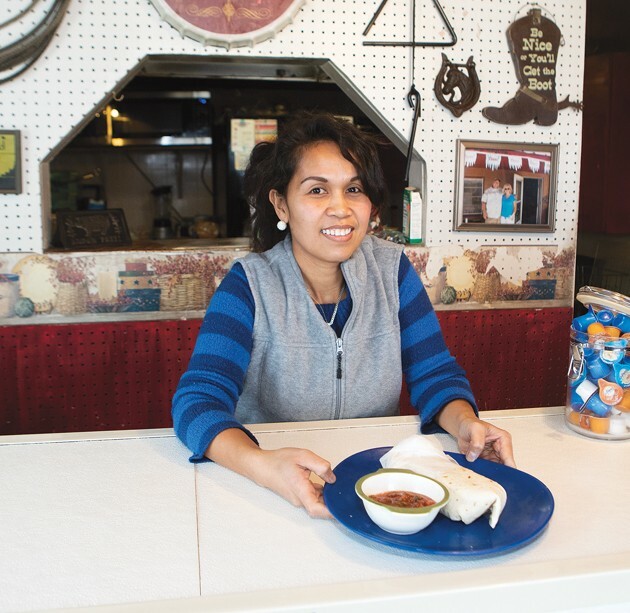 Aillen Calegio serves up a burrito, one of the cafe’s popular items. 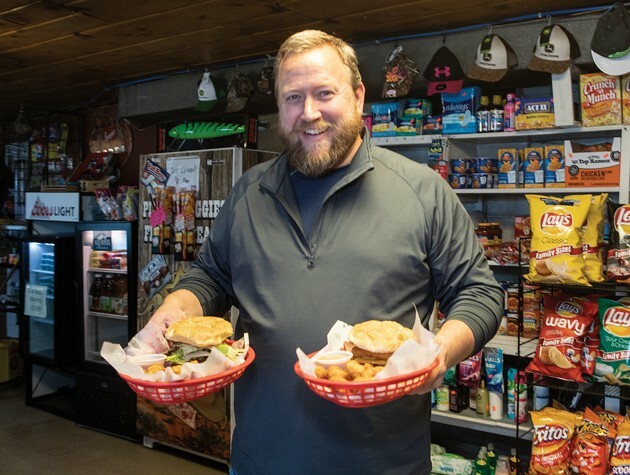 Brian Baldwin serves fresh burgers to customers. Sondra’s Silver Sage cafe/convenience store in Vernon is a unique stop for travelers along state Route 36 in southeastern Tooele County. Sondra’s Silver Sage is located about 30 miles south of Tooele on SR-36. Brian and Jenny Baldwin of Murray purchased the business 4 and a half years ago from Tooele County Recorder Jerry Houghton. The new owners named the business Sondra’s Silver Sage after Jenny Baldwin’s grandmother Sondra Rigby, who lived in Vernon. “I drove my Harley out here about seven times trying to talk myself out of it,” Brian Baldwin said. 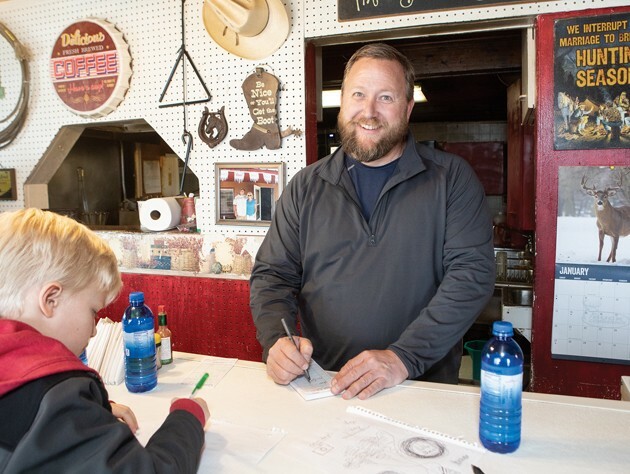 After running the business part-time for nearly 4 years, he now works full-time at Sondra’s Silver Sage. Baldwin did not enter the retail business cold. He has several years of experience working as a manager in the grocery industry, with stints at M&M Distributing and Harmons Grocery. 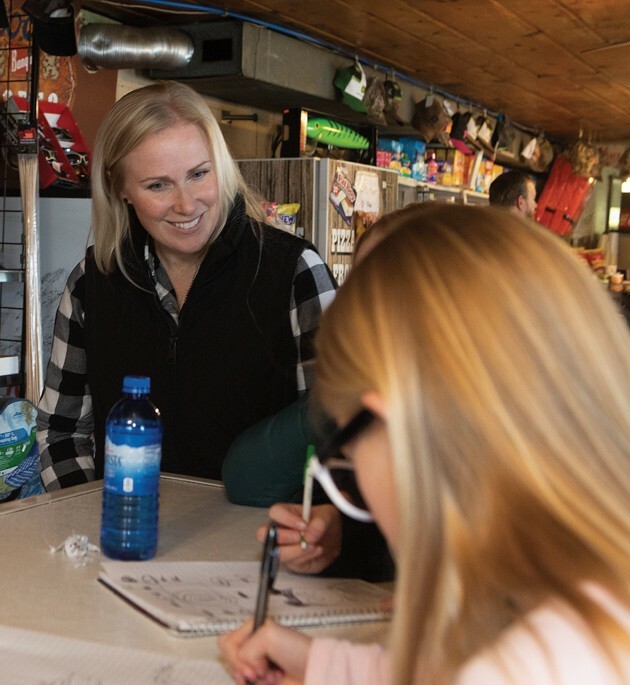 Along with the cafe, the store features a wide variety of drinks, snacks, firewood, ATV offroad trail maps, Pony Express books, fishing poles and worms. “Our top-selling item is Mountain Dew,” Baldwin said. Sondra’s Silver Sage is open from 10 a.m.to 6 p.m. December through February, and from 8 a.m. to 8 p.m. March through November. It’s open seven days a week. The cafe provides breakfast, lunch and dinner. Breakfast items include sandwiches, French toast, burritos, Belgian waffles, omelets and pancakes. The menu features 10 varieties of sandwiches, along with fries and tater tots. Some of the top-selling burgers are the Cowboy, Firefighter and Vernon Burger. Other items include smothered burritos, taco salads and Nacho Average Nachos. Fuel is available and recreational vehicles can also set up on the site at $20 per day or $350 per month. “People from Vernon come here for supplies,” Baldwin said. “They need us because the next services are 30 miles away.” He estimates the population of the town at approximately 300. 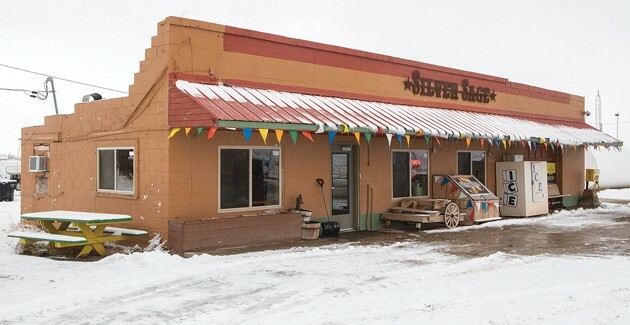 Seven employees work at the business during the peak season, and one of them possesses a talent that can make visiting Sondra’s Silver Sage even more unique. Aillen Calegio came to the United States from the Phillipines in 2007. She lived in Las Vegas for one year and then moved to Vernon with her boyfriend. Five years ago, she learned that people liked to hear her sing. She said the audience enjoyed the song, and now singing is a big part of her life. 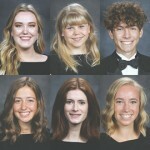 If asked, Colegio will perform for customers at Sondra’s Silver Sage. She usually sings “Coal Miner’s Daughter” by Loretta Lynn, “Crazy” written by Willie Nelson and made popular by Patsy Cline, and “Can’t Help Falling in Love” written by George Weiss and made popular by Elvis Presley. 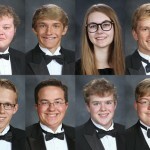 Colegio said “Coal Miner’s Daughter” reminds her of life in the Phillipines. A friend who worked at Sondra’s Silver Sage asked Colegio if she would like to work there. She has been since March 2015. 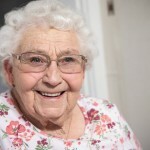 She sang the “National Anthem” prior to a demolition derby and has sung at both the Grantsville and Tooele Senior Citizen centers. Colegio also performed at the Rocky Mountain Nursing Home and at Canyon Cove Apartments. She has also auditioned for “America’s Got Talent” in Las Vegas and “The Voice” in Salt Lake City, but was not selected to go on the shows. “I wasn’t disappointed because thousands try out and only 200 appear on the shows,” she said. But Colegio won a karaoke contest at the Queen Asia Restaurant on Redwood Road in Salt Lake City three years ago. The next step in her music career is to make a CD because she said her fans have requested it. Meanwhile, Sondra’s Silver Sage is a frequent stop for many people. Tarbox said Sondra’s Silver Sage gets crowded in the summer because of the recreational activities in the area. It’s not busy during the winter, but Baldwin does things to attract people and customers — like a car show. Grantsville’s Scott Jefferies raved about his first visit to Vernon and Sondra’s Silver Sage. And if Colegio is on duty, he can hear her sing her popular songs.